Three rectangles of utility fabric at least 7" X 9"
Three rectangles of cutaway stabilizer at least 7" X 9"
1. Hoop one rectangle stabilizer and one rectangle fabric. 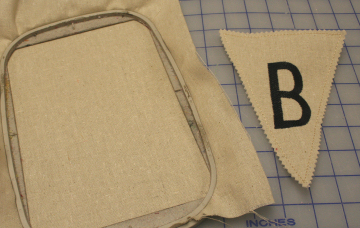 Embroider the B banner design. 2. Remove from hoop and pink around the banner shape. 3. Repeat twice for the O banner design. 5. Center and sandwich one completed O banner into the folded strip. Pin. Measure 1" right and insert the second O banner. Then 1" left of the center banner and insert the B banner. 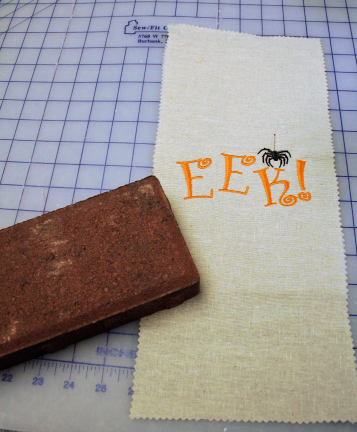 Sew all along the open edge to complete the banner. One rectangle tear away stabilizer 8"X9"
1 . Center the fabric and stabilizer in the hoop. Embroider the EKKS design. 2. Remove the embroidery from the hoop. Remove the stabilizer if desired. 3. Recut the rectangle to 7"X 11" Then barely pink around the edges. 5. Add ribbon or other accents if desired to your wrapped brick. 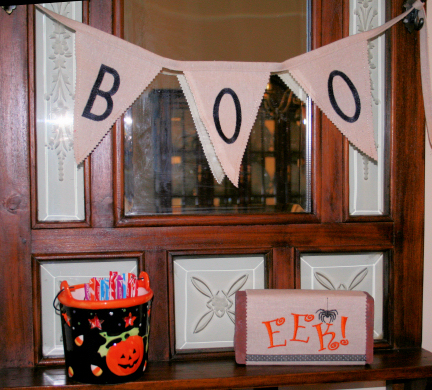 Quick, easy and fun Halloween décor for the porch or the mantel. 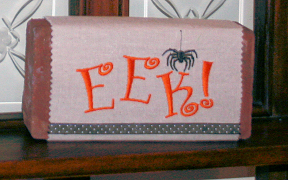 Note: We will be making more of these using smaller fabric rectangles to use as candy bar wraps for the dance and guitar teacher gifts. And there are some additional candy bar wraps here. I'll post the rest of our Halloween decor soon.